visit Official Website of http://hcraj.nic.in/ and apply Online from 14th February, 2017 (Tuesday). Date for deactivation of link to fill up the Online Application form is 06th march, 2017 (Monday) up to 11.59 PM. After filling the Online Application form for District Judge Cadre posts candidates will obtain a print out of it and remit the same to given Address. Selection Process consists of written exam followed by Interview. The scheme of written test for Rajasthan High Court District Judge Cadre Jobs will consists Paper I, Paper II and Language (which includes translation, essays, precis, essays etc). 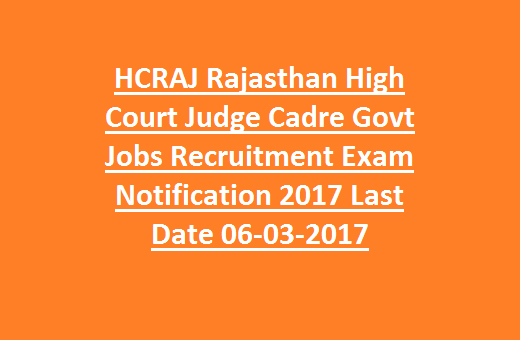 All details of Rajasthan High Court Judge Recruitment 2017 mentioned below. 1. Date for Activation of link to fill up the Online Application form is 14th February, 2017 (Tuesday). 2. Date for deactivation of link to fill up the Online Application form is 06th march, 2017 (Monday) up to 11.59 PM. 3. Closing date for receiving the print out of Online Application form along with documents is 24th march, 2017 (Friday) during working hours. 4. Issue of Admit Card will be updated soon. 5. Tentative Written Exam date will be notified soon. 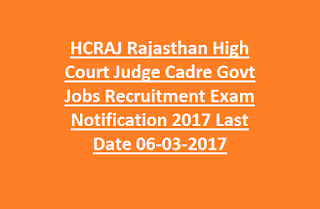 As per Recruitment of High Court of Rajasthan, Jodhpur total Available Vacancies are 27. Lower age limit for all category candidates is 35 years and Upper age limit is 45 years as on the last date of Online registration of Application forms. There is a relaxation in age limit up to 5 years for Scheduled caste (SC), Scheduled tribe (ST), Other Backward Classes (OBC) category candidates. Educational Qualification for candidates must be Bachelors degree in Law (Professional) from a recognized university. Rs.51550/- to Rs.63070/- per month. Selection Process consists of written exam followed by Interview. The scheme of written test for District Judge Cadre Jobs will consists Paper I, Paper II and Language (which includes translation, essays, precis, essays etc). For ST, SC, PWD category candidates Application Fee is Rs.250/-; For OBC Candidates Application Fee is Rs.500/-; For All other Candidates Rs.800/-. Demand draft of exam fee of any bank in favour of 'Registrar General, High Court of Rajasthan, Jodhpur' payable at Jodhpur. Interested candidates may visit Official Website of http://hcraj.nic.in/ and apply Online from 14th February, 2017 (Tuesday). Date for deactivation of link to fill up the Online Application form is 06th march, 2017 (Monday) up to 11.59 PM. After filling the Online Application form, candidates will obtain a print out of it and after mentioning details of demand draft, remit the same to below Address.